As John Hussman points out, the market is poised to deliver nothing over the next decade, with a 40% to 55% “dip” in the foreseeable future. The imminent 50% plunge in global stock markets would put a crimp in the lifestyles of the rich and famous. They needed time to unload their holdings on the dumb money and go short before letting the house of cards crash down again. - Sverige i EU-förhandlingarna lyckats driva igenom en metod för att beräkna skuldnedskrivningar vid en eventuell krasch som baserar sig på så kallade riskvägda tillgångar. - Det gynnar svenska banker som har stor andel bolån, med låg risk, i sina låneportföljer. Läser dom inte Cervenka på SvD Näringsliv? The cardinal mistake of our time was the decision to muddle through the eurozone crisis. Europe’s political leadership failed to generate the public support for what was needed: creating a political and economic union. With hindsight, the EU was wrong to construct a single currency without a proper banking union. It was wrong to create a passport-free travel zone without a common border police force and immigration policy. I would add EU enlargement to this list — not the principle but the haste with which it was pursued. There is obviously someting wrong with economics and the world economy. It is now 8 years since 2008 and we are still not back to the new or the old normal. QE and ZIRP does not seem to work and many fear a new recession, a market crasch or worse. The usual commentariat does not seem to have the answer. Löfven: Det som attackeras i dag är ett enigt och demokratiskt Europa. "Det som attackeras i dag är ett enigt och demokratiskt Europa. Och det är ett enigt, enat och demokratiskt Europa som kan och ska slå tillbaka." Så sa Stefan Löfven när han i onsdags skulle informera riksdagen om EU:s uppgörelse med Turkiet. Stefan Löfven var ordförande för Fackliga röster för Europa inför folkomröstningen om euron. And the Weak Suffer What They Must?. Efter mer än 50 års läsande av ekonomi blir man sällan så imponerad. former Bank of England Governor Mervyn King said Monday. U.K., France, Spain, Greece, and Croatia. Three more countries — Finland, Poland, and Romania — are seen posting deficits at the threshold. Nu åker ett antal regeringschefer hem och säger dels att de är stolta över vad de kommit överens om, dels att det är EUs fel. Men fattades beslutet verkligen av EU? Att ett antal regeringschefer kommer överens om något gör det inte till ett EU-beslut även om det har fattats i en lokal smyckad med EU-flaggor. EU har (ännu) inte beslutsrätt över migrationsfrågorna. Av den anledningen var det nödvändigt med ett enhälligt beslut. Varje land hade kvar rätten att säga nej. Ett riktigt EU-beslut, beslut i en fråga där EU kan fatta beslut genom QMV = Kvalificerad Majoritetsomröstning, och köra över ett antal länder, var det inte fråga om. De regeringschefer som åker hem och skyller på EU gör detta utan grund. The FOMC dares not tighten despite core inflation reaching 2.3pc because it is so worried about financial markets. Ambrose. Interest rates in the United States have fallen to minus 2pc in real terms and are dropping into deeper negative territory with each passing month. This is a remarkable state of affairs. It is clear that the US Federal Reserve is now trapped. The FOMC dares not tighten despite core inflation reaching 2.3pc because it is so worried about tantrums in financial markets and about that other Sword of Damocles - some $11 trillion of offshore debt denominated in dollars, up from $2 trillion in 2000. Mervyn King, former governor of the Bank of England. During the pre-crisis period that economists called “the Great Stability” or “the Great Moderation”, output rose at rates close to historical averages. While this looked sustainable to most central bankers, who congratulated themselves on the stability engendered by their inflation-targeting regime, the composition of demand was problematic. A “savings glut” emerged in Asia, while debt rose rapidly in the developed world. Savings and investment in several large countries were out of kilter. Interest rates today, he says, are too high to permit rapid growth of demand in the short run but too low to be consistent with a proper balance between spending and saving in the long run. The disequilibrium persists, as does a misallocation of capital to unproductive investments. Man har väl som utredare hos moderaterna och Timbro valt basår och skalor för att få diagrammen att visa vad man vill. 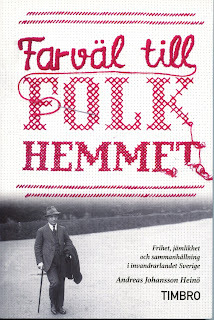 Men ändå. If our monetary central planners still can’t see their way clear to more than 38 bps of normalization, then, apparently, they intend to keep the casino gamblers in free carry trade money until they finally blow themselves up——just like they have already done twice this century. The trigger for the next global recession is at last coming into view after a series of loud distractions and false alarms. The Atlanta Federal Reserve's gauge of "sticky-price" inflation in the US soared to a post-Lehman peak of 3pc in February. This index is a 'pure' measure of core inflation - the underlying story once the noise is stripped out. Mr F spelled out why the 1970s 'Phillips Curve' trade-off between unemployment and inflation is alive and well, and an implicit warning that prices could soon off take since the labour market is clearly approaching the electric fence of Milton Friedman's NAIRU (non-accelerating inflation rate of unemployment). Dutch and French voters rejected the EU constitution in 2005. Still, European leaders charged ahead, leaving the masses behind. The EU ideal was taken for granted rather than explained and marketed to the public. The introduction of the euro without banking and fiscal union further undermined the long-term viability of the European project. Ideally Europe would move speedily toward supplementing its monetary union with a full-fledged economic, fiscal and political union, but this is politically infeasible in the short run. 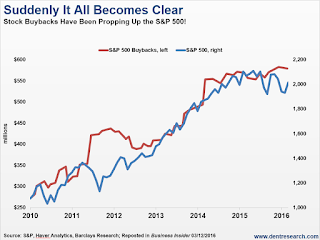 S&P constituents are poised to repurchase as much as $165 billion of stock this quarter, approaching a record reached in 2007. The buying contrasts with rampant selling by clients of mutual and exchange-traded funds, who after pulling $40 billion since January are on pace for one of the biggest quarterly withdrawals ever. S&P 500 companies have churned out more than $2 trillion of repurchases since 2009, helping sustain a rally where share prices almost tripled. The solution is straightforward. It is to fix the problem of deficient demand not by attempting to further loosen monetary conditions, but by boosting public spending. Governments should borrow to invest in research, education, and infrastructure. Currently, such investments cost little, given low interest rates. Productive public investment would also enhance the returns on private investment, encouraging firms to undertake additional projects. Assume you trust Mr Draghi’s commitment to the inflation target. Would you, as a private investor, buy a 10-year corporate bond that yields 0.5 per cent? If inflation really were to reach 2 per cent within two or three years, you would surely make a loss. The only reason you would want to make a long-term investment at these rates is that you do not believe in the target. and I tell you that because the piece that follows is as close to capitals, underlining, and bolding with lots of exclamation points as Mohamed can get. He continues to get more concerned about the direction of central bank policy around the world and its unknown and unintended potential consequences. EU skulle skapa fred på Balkan genom att göra de forna jugoslaviska staterna till en del av gemenskapen. I dag är det i stället EU som ”balkaniseras”. I’ve been collecting possible story lines for a while now. I make no claim that the eight here are an exhaustive list. Together, though, they paint an interesting picture, if not a clear one. Stephen S. Cohen and J. Bradford DeLong simply recommend that discussion of economic policy focus on the concrete - what works - rather than theory and ideology. Since the end of World War II, we have had a recession every 5–10 years or so. Our experience was that they always gave way to an expansion that made up the lost ground and then some. It hasn’t worked that way this time. We entered a recession in late 2007 that officially ended in September 2009. Now it’s 2016. This month will mark 8½ years of economic expansion. So why is no one cheering? Because the less than 2% average growth we have seen since the end of the recession (and actually, since the year 2000) has added very little real income to most American households. Gratis pengar uppskattas av alla. Men baksmällan blir svår när Stefan Ingves sociala experiment avslutas. Hushållens skuldsättning fortsätter inte bara att öka, utan accelererar till och med. Den senaste månadssiffran visar att hushållens krediter ökade med 7,5 procent på årsbasis, vilket gör att skulderna i relation till inkomster slår nya rekord. Nu är den runt 1,8 årslöner, vilket gör svenska hushåll till de mest skuldsatta i världen, slagna bara av ett par länder. Och inte verkar någon bry sig. Att vi tillåter denna galenskap är egentligen lika obegripligt som den faktiska penningpolitiken. Från politiskt håll är det bara europaparlamentarikern Gunnar Hökmark som i olika artiklar har reagerat. Vi befinner oss fortfarande nära toppen av bostadsprisbubblan. Vi har fortfarande svenska löner och kinesiska priser. I själva verket har Merkel redan bytt linje, till förmån för en mycket restriktiv kurs. EU:s toppmöte med Turkiet i Bryssel blev ett försök att stänga dörren för flyktingarna – men inte vid Tysklands gräns, utan vid Greklands gräns mot Turkiet. Genom att baxa in EU på en gemensam linje hoppas förbundskanslern rädda hela unionen. Men det kostar. Behind the backs of some her closest European allies, Angela Merkel, German chancellor, struck a deal with her Turkish counterpart that could very well end the influx of refugees washing up on Europe’s shores — but at a very high price, including an extra €3bn in aid and a visa-free travel scheme. Some senior officials say the disorderly process belies a potentially transformative outcome. Others are more downcast. “This was one of the lowest points of my time in the EU, an indictment of the way we operate and the way we act,” said one EU ambassador. Till 26 av 28 regeringschefers förvåning – presenterade Tyskland och Turkiet ett helt nytt förslag för hur man ska återta kontroll över situationen. Tanken är att alla flyktingar som når Grekland från Turkiet (vilket i princip rör alla), oavsett nationalitet och bakgrund, ska skickas tillbaka till Turkiet. Därefter är tanken att Europa ska ta emot samma antal (en-mot-en-fördelning) men då endast människor som flyr från krigets Syrien. Martin Wolf: Will IT disrupt finance? Please. Yes. Bill Gates. Information technology has disrupted the entertainment, media and retail businesses and, most recently, the supply of hotel rooms and taxis. Is it going to do the same to finance? My first response is: please. My second response is: yes. “We always overestimate the change that will occur in the next two years and underestimate the change that will occur in the next 10.
Credit spreads widened to a point where markets fretted about a first-time cancellation of coupon payments on contingent convertible bonds (CoCos) at major global banks. Underlying some of the turbulence was market participants' growing concern over the dwindling options for policy support in the face of the weakening growth outlook. With fiscal space tight and structural policies largely dormant, central bank measures were seen to be approaching their limits. The policy would bypass governments and the financial sector. The financial markets would hate it. There is nothing in it for them. The US is the greatest republic since Rome, the bastion of democracy, the guarantor of the liberal global order. It would be a global disaster if Mr Trump were to become president. Even if he fails, he has rendered the unthinkable sayable. U.K.'s Chancellor Osborne: "Varoufakis was recruited because Chairman Mao was dead and Mickey Mouse was busy." U.K.'s Chancellor George Osborne ridiculed a report saying that Varoufakis was advising the opposition Labour party, telling the House of Commons that "Varoufakis was recruited because Chairman Mao was dead and Mickey Mouse was busy." "So when George Osborne comes out and pokes fun at me, obviously trying to luxuriate in the fact that I'm a defeated finance minister, yes, I am a defeated finance minister but in the hands of whom? Of an iron-clad European Union that decided to asphyxiate us using bank closures in order to impose upon us another extend and pretend bailout. The British people know that." "Does George Osborne really seriously believe that by mocking me he is doing himself any favors in his intellectual class? Banks issue a wider array of bonds than most “normal” companies. Regulation, especially after the financial crisis, has created different classes of debt that serve a variety of purposes. Riskier bank bonds are designed in such a way that they take or “absorb” losses when financial institutions run into trouble, and they pay investors a high coupon to compensate for this risk. New rules for bank debt mean that senior unsecured debt — previously close-to-untouchable in a crisis and ranked alongside deposits — is now exposed to losses when banks fail. These new rules are being implemented in different ways in across Europe. Otmar Issing - a former chief economist at ECB: Five Presidents Report creating a fiscal union "without democratic legitimacy". Speaking of the European Commission's Five Presidents Report Mr Issing said it was a step towards creating a fiscal union "without democratic legitimacy". Professor Otmar Issing - a former chief economist at the European Central Bank and architect of the euro - said EU policymakers would not dare put their plans to transfer budgetary sovereignty to Brussels before electorates as they would fail at the first hurdle. EU elites were afraid to "confront" voters, delaying their plans for integration until after 2017, the year France and Germany hold national elections. – Det är faktiskt frivilligt att låna pengar. När dåvarande Swedbank-chefen Jan Lidén fick frågan om banken kände något ansvar för att tre länder i Baltikum var på väg att sugas in ett svart hål lyste självkritiken med sin frånvaro. Flera års generös kreditgivning från framförallt Swedbank och SEB:s sida slutade med att båda bankerna var nära att gå omkull och nästan drog med sig Sverige i fallet. Åtminstone om man ska tro förre finansministern Anders Borg. Är samma sak på väg att ske igen? Det var inte jättelänge sedan som den som varnade för en svensk bolånebubbla sågs som en apokalypsens generalagent i filthatt och fotsid rock. I dag krävs det nästan en skallgångskedja från Missing People för att hitta en ekonom eller politiker som inte är orolig. Till den bekymrade skaran hör numera också bankdirektörer. The cascade of financial woes would result rapidly in a worldwide financial crisis. The position is eerily similar to 1997-98, when falling commodity prices, especially oil, a stronger U.S. dollar, rising U.S. interest rates, and emerging-market debt weaknesses led to the Asian monetary crisis, the Russian default, and the collapse of hedge fund Long Term Capital Management. This is the third installment of ‘Crash Course,’ a five-part series from commentator Satyajit Das on threats investors face in the current market climate. The mispricing of assets across world markets has reached epidemic proportions. Since 2007, no major economies and just five developing economies have reduced the ratio of debt to GDP in the real economy (households, corporations and governments). In contrast, 14 countries have increased their total debt-to-GDP ratios by more than 50 percentage points. More than 20 countries now have debt-to-GDP ratios above 200%, led by Japan (400%). Next: How the financial crisis could spread. I'm almost certain that more infrastructure investment would be a smart part of any new U.S. economic strategy. But I'm not so sure what should be built and where, or what else the nation should be doing. It's unlikely that any one person would have all the answers anyway. Justin Fox was the editorial director of the Harvard Business Review. Although I worked for three years in the Clinton Treasury Department, and am a card-carrying member of the economist guild, I predicted none of this. Like most of my peers, I was wrong. Yet the most interesting thing is that I could have - should have - been right. I had read economist John Hicks; I just didn’t quite believe him. 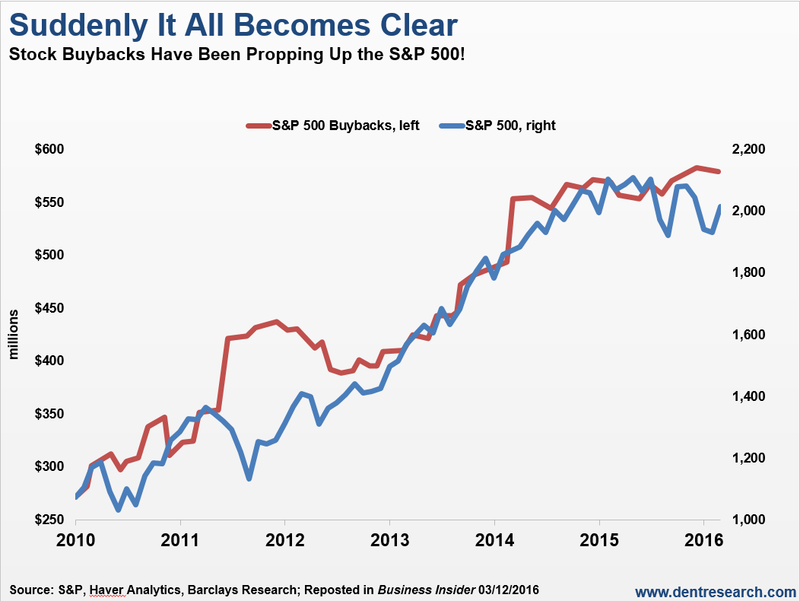 The high volume of share buybacks in 2015 in a fascinating light. US companies spending more than $700bn on their own shares. The May 2007 BoE annual report, endorsed by Lord King, then the Bank’s governor, said financial stability risks “appeared to be low”. It was almost the eve of the financial crisis. A sharp decline in the S&P 500 has signalled a recession nearly 60 per cent of the time.